1. Contact allergy. This occurs when your Pomeranian comes into contact with something to which he’s allergic. Such elements include: carpet cleaner, shampoo, the material is dinner bowl is made from and laundry detergent (used to wash his bedding). 2. Allergic to food. 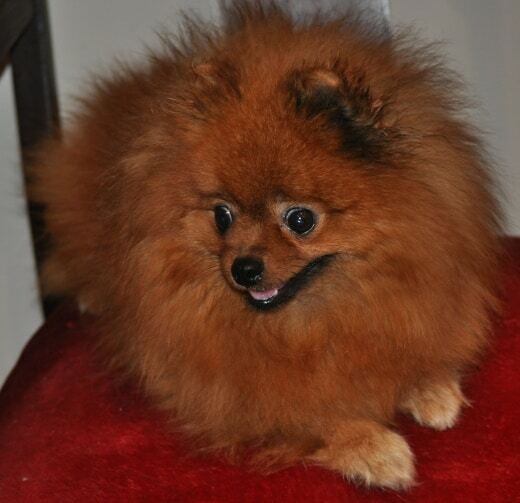 This is a food category but Poms and many toy breeds are often actually allergic to a food additive. Additives include: colouring, flavour, preservatives and various other chemicals that make up the ingredients list of certain dog foods. 3. Environmental allergy. Your dog may inhale something that causes an allergic reaction. It may be pollen, weeds, grasses and other things in the air. Although at a higher level outside, they can also be a problem inside the home. Normal transference can cause it but your dog may bring pollen and other environmental elements into your home as well. 4. Stings. Wasps, bees and various other insects that can sting may cause your dog to react badly. This form of allergy occurs less often than the others. Minor stings can be treated with Benadryl and, for the pain, baking soda. 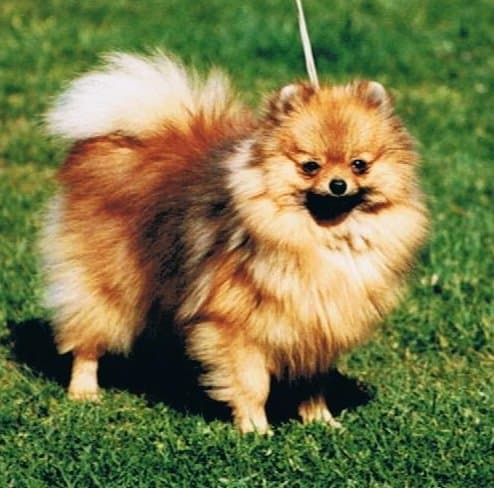 However, some Pomeranians may have an extreme reaction and go into anaphylactic shock. Signs of allergic reactions can be manifested in a lot of ways. Itching. All allergy issues can make your pet suffer from moderate to severe bouts of itching. This alone may cause other problems. Irritated skin. This may appear either as big spots or a rash made of itchy bumps. They are often called “hot spots.” Skin can be red or pink and hair may thin out as a result of the problem or caused by scratching. If your Pom licks, scratches or chews on the irritated area, the skin can be cut and break open, allowing infection to enter as well. Hair loss. A dog’s healthy coat relies on having healthy skin. Long-lasting allergies can cause the coat’s hair to thin out. Changes in bowel movements. If a dog has food allergies, his gastrointestinal tract may be disrupted and that can cause runny or loose stools. Upset stomach. Like the runny stools, an upset stomach may cause a reaction in the dog due to something he has eaten. This is regardless of whether he does or doesn’t vomit. Watery eyes/discharge. This symptom usually happens with inhaled or contact allergies. There may be a thick, yet watery discharge and the thickness can vary from dog to dog. 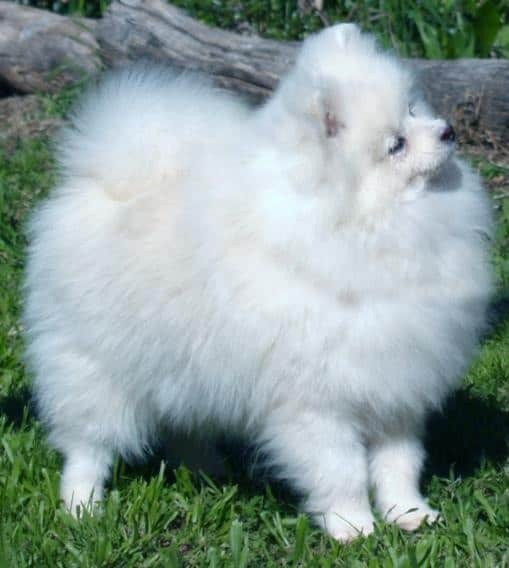 Some Poms may experience a thick discharge, often building up overnight as he sleeps. When he wakes up, his eyes are crusty Red, bloodshot eyes. Apart from the water eyes, they can look irritated and red. Ongoing bloodshot eyes is a typical allergy symptom, although the problem may sometimes be caused by the eye getting scratched or something getting into it, like wind blowing dust, etc. Nasal discharge. This symptom isn’t as common in Poms as many other symptoms, but it can occur in those with seasonal allergies. Breathing issues. This includes wheezing and being short of breath. Days when there’s high pollen levels in the air can aggravate this symptom. Although this is generally a seasonal problem, if enough pollutants are brought into the home, then it may be a chronic problem unhindered by the season. Diagnosing allergies. When your pet has ongoing allergies, it’s vital to have an experienced vet conduct certain tests to determine the triggers for your Pom’s allergies. Many dogs are allergic to more than one thing so once you know what his triggers are, you can take steps to minimise or stop your dog getting exposed to such triggers. Skin allergy and blood tests can be conducted. However, it’s crucial to remember that tests aren’t always as accurate as they should be. Tests are only done to search for the most common dog triggers, not for every possible dog allergen. How to diagnose food allergies at home. If you really think your Pomeranian is allergic to something in the food he eats, you need to check ingredients for everything you put in his mouth and this also includes all treats. Bright colouring is often guilty. Look at his whole diet, not just the suspect foods. The goal of this method is to let the symptoms disappear and let him rest before testing him to determine the reaction. This is his new regime. For two weeks, his meals should be white chicken meat (no bones or skin) and choose between sweet potato and white rice. The meals should have no seasoning on anything, except perhaps a pinch of salt. After these two weeks, the symptoms should have been eliminated. Now it’s time to add one extra food to the mix. Feed your dog the same food, with the extra food added and do this for two weeks. Monitor him to see if he reacts. If not, add another food every two weeks and follow this same process. A majority of Pom owners find healthy food does their pets the world of good. This proves that it’s chemical additives that cause the problems. Some owners may decide to keep their dog on this diet to avoid future possible allergies. If so, then dogs should also be given healthy, crunchy treats so their teeth remain strong, healthy and clean. How to treat allergies. Your vet can treat your beloved Pom’s allergies in numerous ways that will also identify the allergy causes. Treatment options (depending on the type of allergies(s) include: • Topical treatments. Generally used if your pet’s skin reacts badly to the allergen. • Eye drops. These help eliminate bloodshot eyes. • Antihistamines. Benadryl is one good antihistamine. However, owners should never give their dogs any at home without prior advice regarding the correct dosing. • Antibiotics. These will be used if skin sores have opened and an infection has occurred. • Corticosteroids. Used just for a short time when the dog has moderate to severe swelling and itchiness. Tips on controlling allergies at home. For inhaled / airborne allergies: Owners can do a lot to clean their home and make it a safe, healthy environment for their Pom. There are ways to help reduce or eliminate allergens and these include: 1. If the air is a high pollen day, take your pet for his walk in the late afternoon or early in the evening. Mornings are the worst time for pollutants in the air. You may decide not to walk but to do other fun things at home that your pet enjoys. 2. Wash your pet’s paws after your walk and before allowing him back inside. In the warmer weather, a garden hose is handy. On days that are cooler, carry him to your laundry sink and use canine wipes to clean his paws and lower legs. 3. Vacuum your home regularly with a machine using a HEPA filter. It traps particles in the air and floor. You can also do the curtains and furniture. 4. Running ceiling fans is better than leaving windows open because you get a better flow of air. 5. Use your air conditioner and ensure the filters are HEPA-certified. This means even tiny microbes that linger in the air will get removed. Treatment for contact allergies All clothes and bedding for humans and animals must be washed in a hypoallergenic detergent. This list also includes pillowcases, blankets, washable pillows and blankets. Check all your dog’s stuffed toys. Test by removing them, one at a time, and watch to see if the other dogs play with them (if you have more than one). Sometimes the reaction caused by removing the “allergy” toy eases the stress. Take note of any certain stuffed toys that you may suspect are causing the allergy; we know of a Pom that had troubling allergy symptoms for months and as soon as a certain stuffed toy was removed, his issues cleared right up. Stop using all types of carpet cleaner powders. Dog bowls. Don’t use plastic for your dog’s water and food. He may be allergic Some Poms can have an allergy to the material’s and others may get their face stained. The best dog food bowls are made from stainless steel, closely followed by ceramic bowls. Plastic bowls with lots of colour may end up staining your dog’s face if not careful. Look at all the grooming products you use for your dog. Sometimes cheap priced conditioners, shampoos and leave-in products can cause skin reactions and allergies. Pay extra and get high quality products that will ease any symptoms and also make your dog’s coat and skin much healthier. Your pet may be sensitive to chemicals used on your lawn at home. If this is the case, his skin will react only on his tummy (if it’s long grass), legs and paws. If this is what you suspect, don’t let him on your lawn at all and other lawns that could have weed killers or other chemicals on them.